Health care professionals and their patients rely on an increasing number of portable medical devices, such as mobile IV pumps, blood pressure monitors and defibrillators. 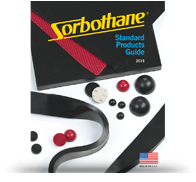 Sorbothane® helps to ensure safe, reliable performance by protecting components and LCD displays against shock and vibration damage. Its versatility, durability and unique memory properties make it ideal for protecting mobile devices, as well as large diagnostic equipment that must perform thousands of repetitive cycles. See samples of solutions we’ve provided to the Medical Equipment industry.